Dharamsala: Geshe Yeshi Gyaltsen, lecturer on Secular Ethics of the Bangalore-based Dalai Lama Institute for Higher Education gave series of talk on Secular Ethics in and around Dharamsala from 17 to 24 October 2017. Eleven trainees and teachers of the DoE’s Montessori Training at Sherab Gatsel Lobling were especially given two half-day talks on Secular ethics on 17 and 18 October. The talks were even attended by Ngodup Tenpa, Education Officer from the Education Department. During the talks, Geshe Yeshi Gyaltsen rationally informed the trainees with real life examples about the importance of values and compassionate heart, as well as the ways to cultivate these values. For the holistic development of the children, he even encouraged the trainees, who are all females, to be more compassionate and empathetic towards children as qualified teachers as well as mothers in near future, so that the children grow up healthy physically, mentally and emotionally. 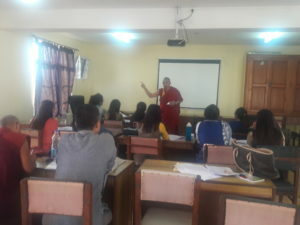 Then the another talk was given to around 250 students and staff including the principal at the College for Higher Tibetan Studies, Sarah on 19 October and to 25 students and five staff including the principal at the Norbulingka Institute on 20 October. 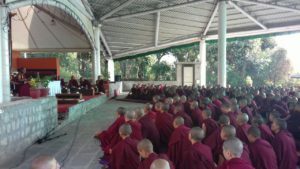 During these talks, Geshe Yeshi Gyaltsen talked about the ethics related specifically to students as well as to all the human beings in general. All the talks were ended with question and answer sessions, during which several doubts of the students were cleared with detailed answers. As received overwhelming response from the students in Mangalore and Bangalore last month, the students here in Dharamsala have also shown and expressed deep appreciation about the programme. Discussions during and after the talk clearly showed their interest in developing such inner values themselves. The final leg of the talk series of this month will be in Chandigarh on 28 October and in Delhi on 29 October 2017. These talk series on Secular Ethics are being organised by the Department of Education.